The Sentori 58R is a design from Christian Gumpold and Christopher Gloning. 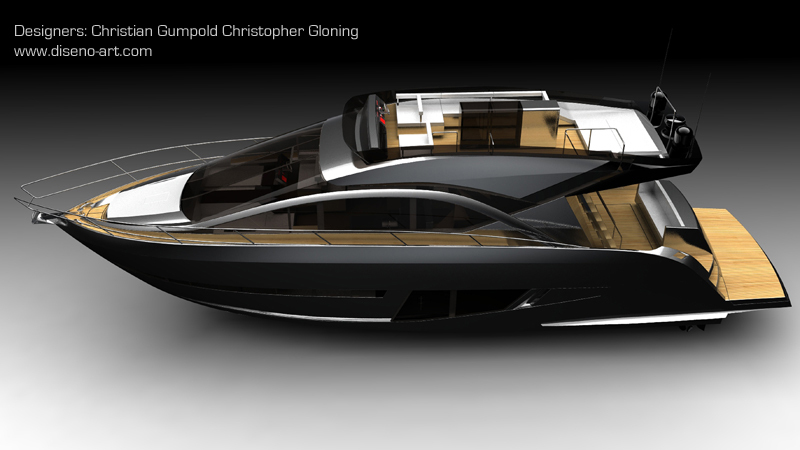 The design was created during their diploma thesis at the university of applied science in Graz, Austria. 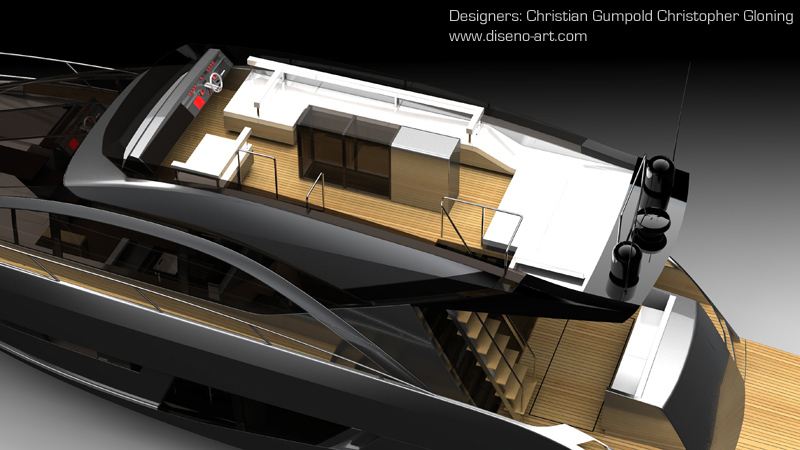 Currently the first prototype, which is due for completion in spring 2009, is under construction in Turkey. The Sentori 58R is a stylish flybridge motor yacht, with three decks, a length of 58 foot (18.5 metres) and a displacement of 28 tons. 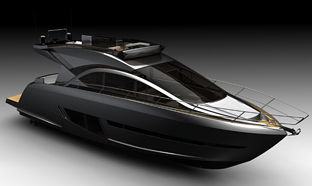 Power comes from a pair of 715 horsepower Volvo Penta diesel engines, giving the vessel a 30 knot top speed. 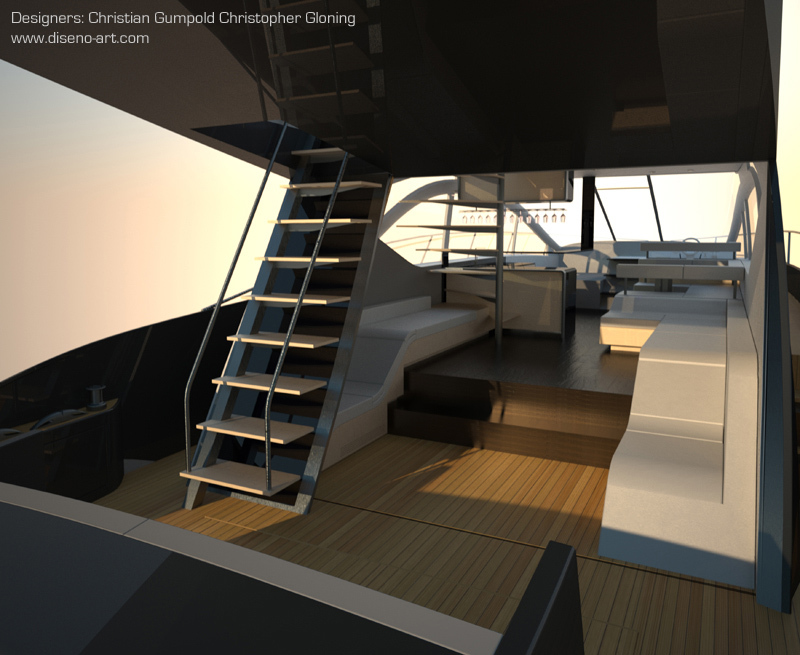 The interior layout of the Sentori 58R is organized into 3 decks: the main deck, consisting of the open air stern-area directly connected to the lounge area, the pantry, dinette, and main helm station, as well as a sunbathing area at the bow section. 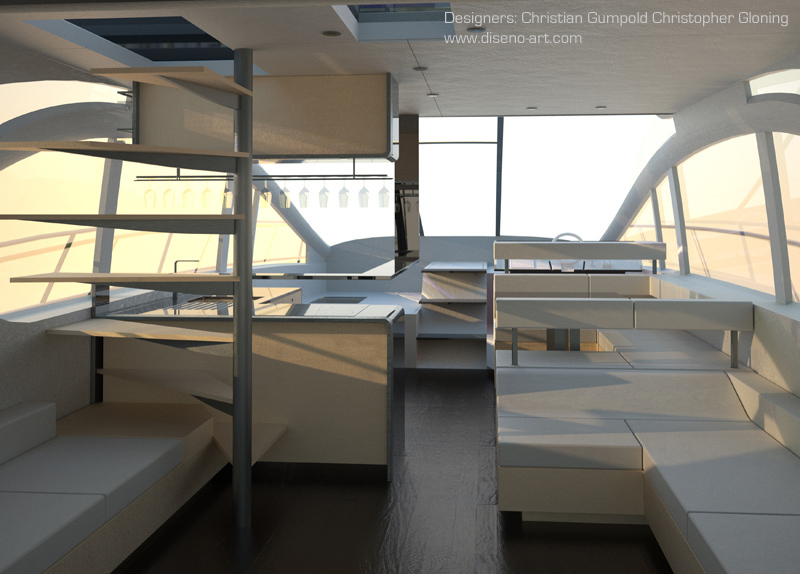 Part of the windshield acts as a door and allows for direct access to the sunbathing area, where a small table for drinks can be extended. Located in the lower deck is the owners state room, the VIP cabin, and the guest cabin, each with their own bathroom, shower and toilet. 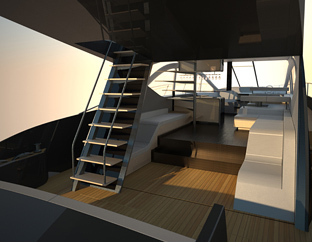 On the top deck is the second helm station, as well as a lounge area, a sunbathing area and the wet-bar including a fridge, a washing basin and a barbecue pit. Because the helm station on the flybridge is exposed to the elements it can be protected by automatically flattening the instruments and covering the whole keyboard with a sliding transparent panel. 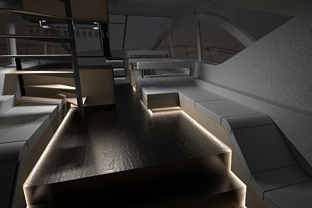 The wet bar is one of the key elements on the Sentori 58R; it does not only serve as a regular bar, but it also acts as a skylight for the main deck and illuminates the flybridge at night. The sleek and modern exterior design of the Sentori 58R was mainly inspired by automotive design, using surface tensions and automotive, coupe- type key influences. 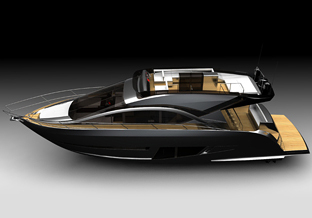 The interior of the Sentori 58R is contemporary and bright thanks to use of light materials and expansive windows. 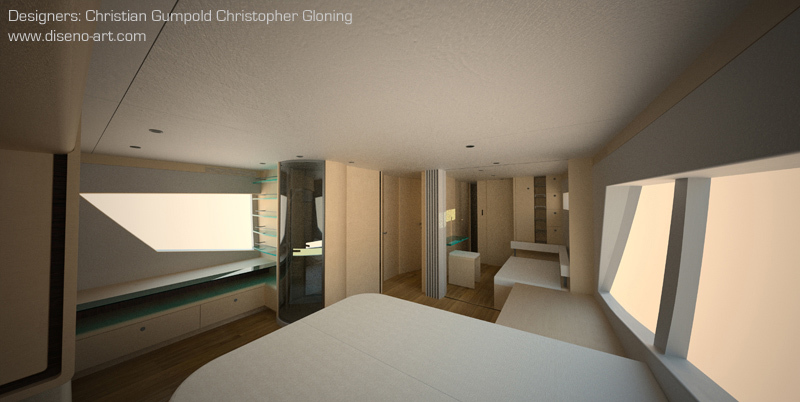 The interior mainly uses floating elements which deal with the different levels and stairs harmonically. 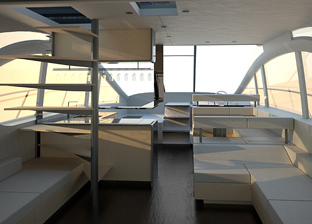 In general, the idea of modern and loft-like living on the sea was the foundation of the Sentori 58R's interior design. 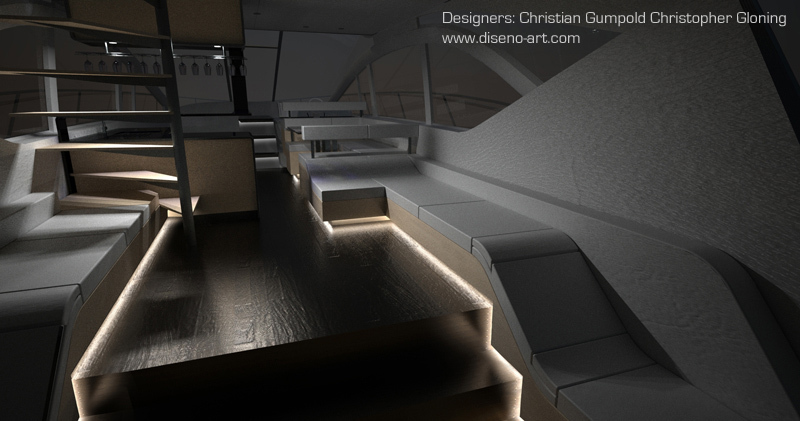 Another key element to the interior was the idea of versatility, the floating lounge elements with their concealed armrests underline this idea. A vessel of this length usually has three cabins, However the Sentori 58R is able to adapt rooms to meet the needs of those on board. 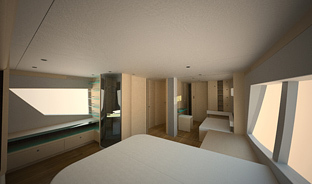 The guest cabin is not only a bedroom but can also be connected to the owner�s state room to extend the living area if wanted. Alternatively it can be used as an office, providing a desk and lounge. The double beds in the owner�s state room and the vip cabin offer the option of transforming them into single beds if required.